"We, in modern-day America, underestimate children's abilities to make reasonable judgments far more than have any other people at any other place or time in history. In the name of protecting children we hurt them, sometimes viciously. As Holt shows brilliantly, children need the same rights to advance their own interests and protect themselves as we grant to adults." -Peter Gray, author of Free to Learn: Why Unleashing the Instinct to Play Will Make Our Children Happier, More Self-Reliant, and Better Students for Life "With his usual profound interest in observing children in the world, Holt presents a series of arguments about the nature of childhood that any serious educator or parent should thoughtfully explore." -Kirsten Olson, author of Wounded By School and Schools As Colonizers "For the sake of our young people, I humbly recommend that if you have read it, it's time to re-read it; if you have not, it's now time. 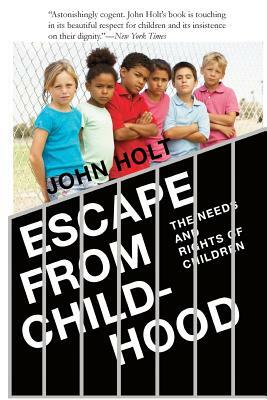 The urgency is that we desperately need a more gentle, loving, and friendly world for our young people and there is no better inspiration than Holt's Escape From Childhood to spur us to action." -Carlo Ricci, Professor of Education and author of The Willed Curriculum, Unschooling, and Self-Direction This is a reprint of John Holt's controversial book about the rights of children and how adults and children can live and learn together more enjoyably and transparently by rethinking their relationships. Under the guise of care and protection, children are kept in the walled garden of childhood, outside the world of human experience, for longer periods than ever before in human history. But for many children and parents, the walled garden of childhood is more like a prison, where authorities compel and limit personal actions. What if children the right to do, in general, what any adult may legally do? The reader who dares to confront such a question will discover new family relationships, not based on parental control, but on the joy of shared experience and responsibilities. John Holt (1923-1985), writer, educator, lecturer, and amateur musician, wrote ten books, including How Children Fail, How Children Learn, Never Too Late, Learning All the Time, and Teach Your Own. His work has been translated into over fourteen languages. How Children Fail, which the New York Review of Books rated as "in a class with Piaget," has sold over a million copies in its many editions. How Children Learn has sold over 750,000 copies and both of these books, written in the 1960s, have remained in print since. John Holt, for many years a leading figure in school reform, became increasingly interested in how children learn outside of school-what Holt called "unschooling." The magazine he created, Growing Without Schooling (published from 1977 to 2001), helped found the modern homeschooling movement, which now has over two million children learning outside of school. Holt's work is presented and continued at www.JohnHoltGWS.com.